Question 3 asked about paraphrasing, summarising and quoting in your academic assignments – did you pick up all the tips? Let's remind ourselves of the question first. Check what you know by trying this activity. Check you've understood about paraphrasing, summarising and quoting by answering these questions. You want to include the main ideas and express them in a shorter form in your own words. What kind of reference do you include in your assignment? You take a short section of the original text and rewrite it in your own words. What have you written? But before we finish, let's take another look at what we've learned about using sources. Check to see if you got all seven tips! Refer to other people's work in your assignments to show you've done research – but always acknowledge the source, otherwise it's plagiarism! You can give a short reference in the main text of your writing – make sure you include the author's name and the publication year for your source. In the reference list at the end of your essay you should include more information about your sources, like titles, chapters, publishers. Summarise long source texts – take the main ideas and express them in a shorter form. 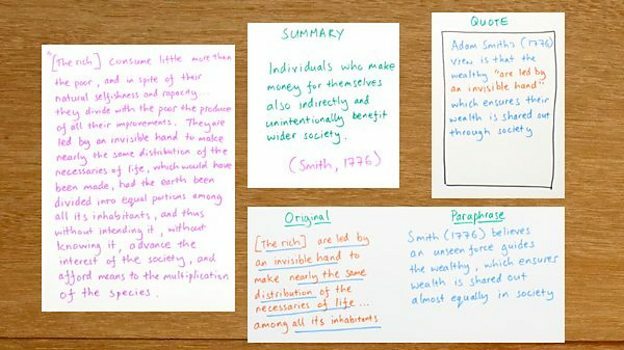 Paraphrase sections of the source text – rewrite them in your own words, changing the vocabulary and grammar. You might want to quote something from a source text directly – especially if it is expressed concisely or is a well-known fact or theory. Don't rely on quotes too much! They should only be used as evidence to support your own points.